Holy crap am I excited....I am FINALLY reading THE book that I have been waiting for allllll year! My super-duper uber-fabulous husband surprised me with it yesterday and you should have seen me jumping up and down and squealing like a little kid! 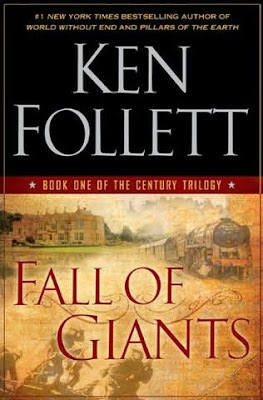 I am a HUGE fan of Ken Follett's The Pillars of the Earth and World Without End so you know I just had to read his newest historical fiction novel, which is the first book in The Century Trilogy and titled Fall of Giants. The hardcover is real boss with smooth, silky pages and I can't wait to dive in. Yay Amy! I went out yesterday and PURCHASED this book with MONEY!!! Might seem completely normal to some folks but they probably don't have piles and piles of unread free books stacked everywhere. :) There are very few books I go out and buy the day they come out...Ken Follett, Diana Gabaldon & Cynthia Harrod-Eagles are the only ones I can think of offhand. Can't wait to start it! Isn't this the one your Husband surprised you with?! I have been meaning to read Ken Follett for the longest time, but haven't yet! I was thinking of starting with this new trilogy, but haven't done anything about getting hold of it yet. I LOVED this one; can't wait 4 your review. Oh, I am so excited for you!! I so want to read this book and am going to have to buy a copy. I am going to be looking very forward to your review, and I hope that you love it! What a good guy your husband is! i'm also a big Ken Follett fan! I loved Pillars of the Earth and I have the second one, but haven't read it yet. I'm really looking forward to this one and the entire new series. I hope it lives up to all of your expectations!